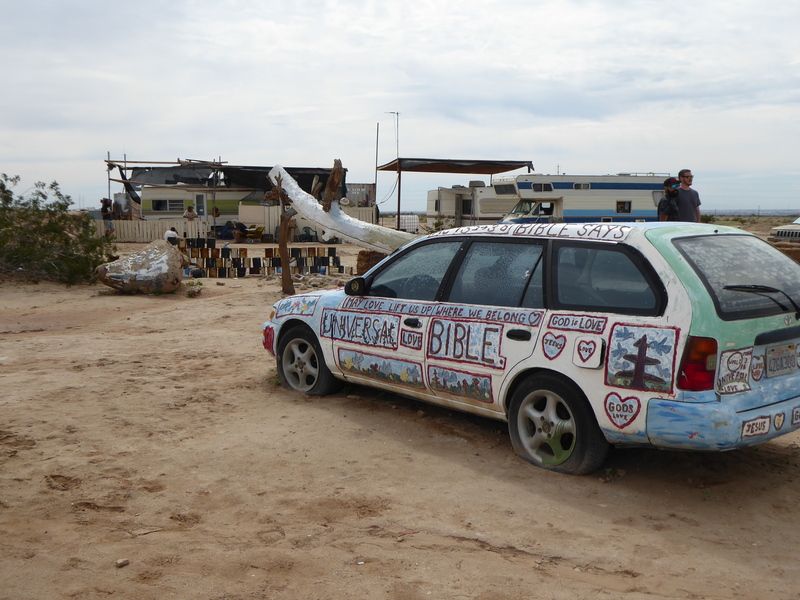 We left early the next morning to see the Slabs and Salvation Mountain. The community is situated on an abandoned War World II Marine Corp base at Camp Dunlap in southern California. 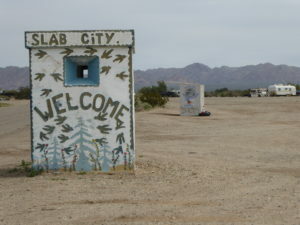 The Slabs are a squatter community. An attractive feature to many because the government basically leaves them alone. Several kinds of people live here, which consists of misfits, poverty, locals, artists and even snow birds. 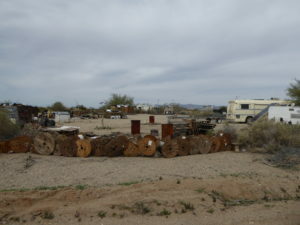 We heard about the slabs from other bloggers and our Quartzsite friends. 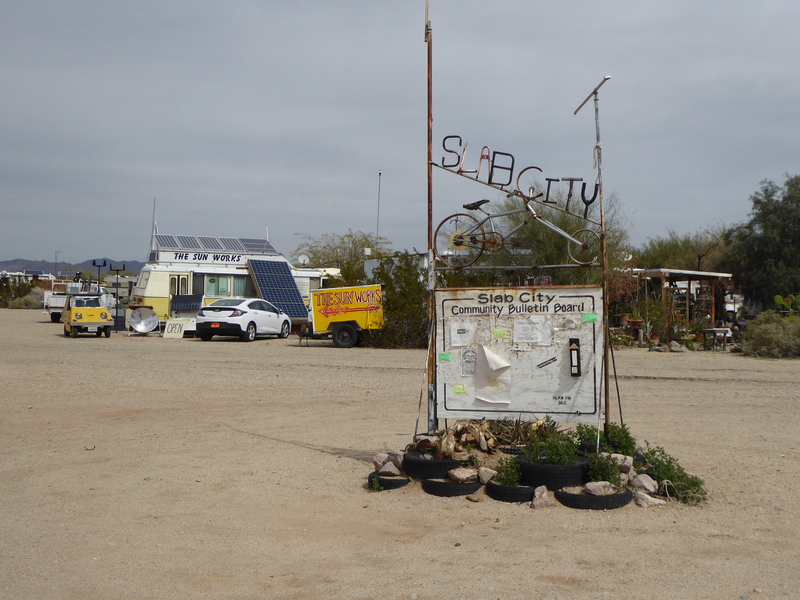 While visiting at the Salton Sea, they handed out directions on how to get here, but advised not to be here after dark! So, with some trepidation about what we were getting into we headed to the slabs! 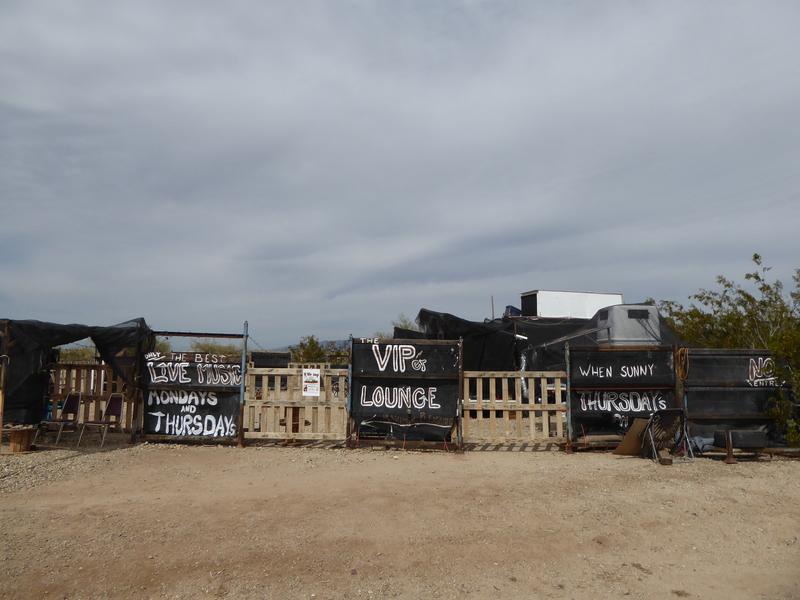 We drove through the Slabs, but did not get out and wonder around or talk to anyone. On this day, there was a yard sale happening. There appeared to be no order in how people set up their homes. There was lots of trash and junk lying around. 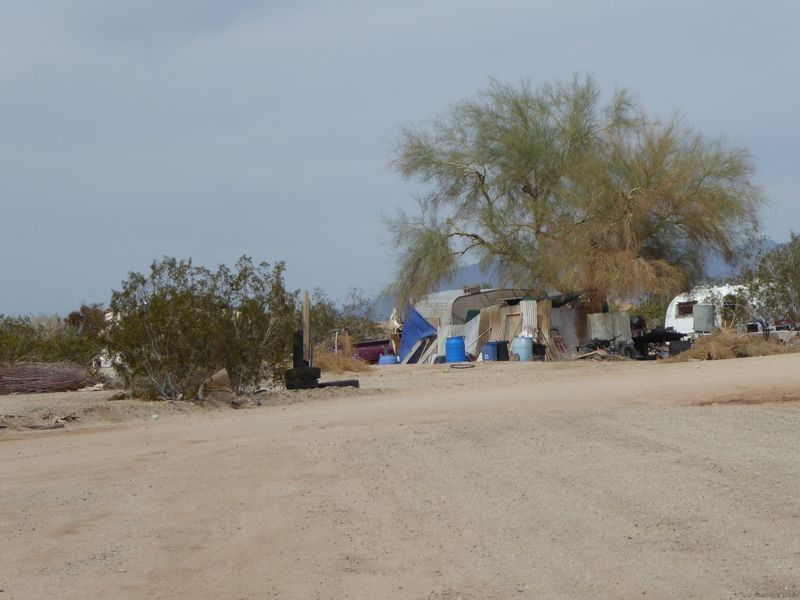 This squatter collected whatever scraps he could find to give his place some privacy. 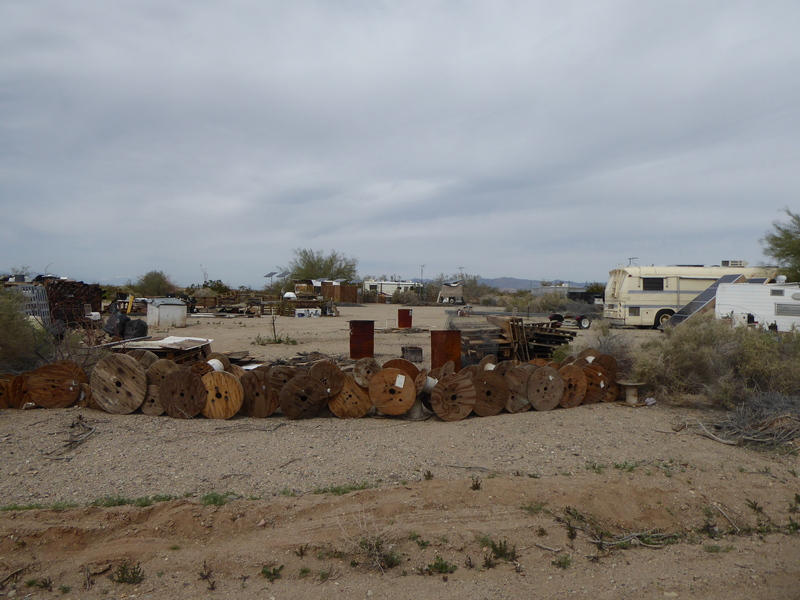 You use whatever is available to designate your property line. This person must have had access to a cable company’s used reels. The lack of government is what attracts many to this free land. There is a sense of community. We saw there was a library, church and a community center. There is even entertainment some nights! 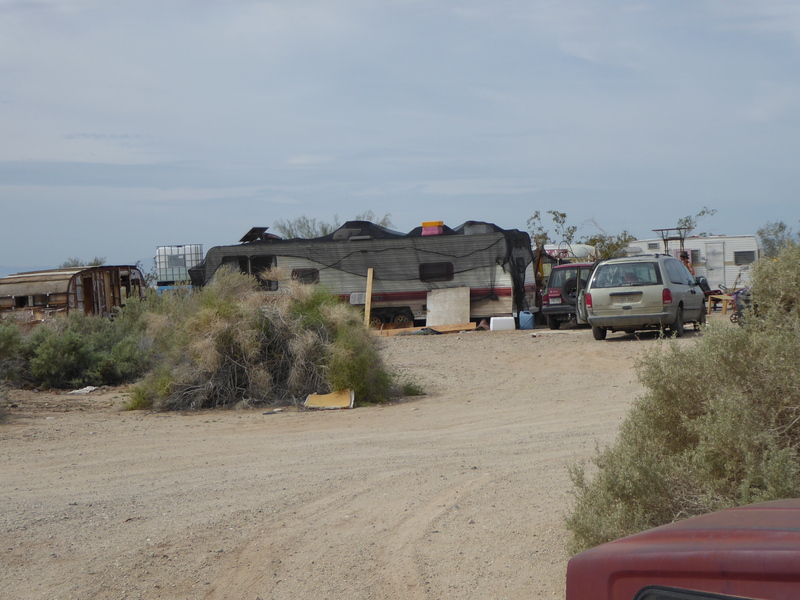 We did see several people by the yard sale area, which was set up on one side of the main entrance road. 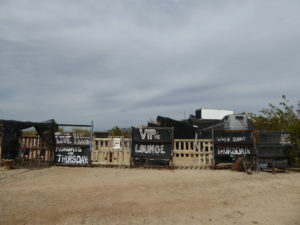 However, we did not see anyone that we thought we would feel comfortable talking with. The area looked pretty rough and there were a few places that we were afraid to take pictures. Supposedly there are snow birds or winter visitors that live in the slabs, but we didn’t see any evidence of that. We do admit that we only went as far as the first road and then we turned around and hi-tailed it out! 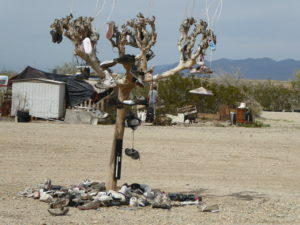 Leonard Knight created Salvation Mountain in 1984, while living in a truck with no electricity or water for almost thirty years. He found religion in mid-life as well as frustration. His love for God was strong, but he couldn’t find any religion that was right for him. He struggled to find a simple religion. His message in creating Salvation Mountain was for the world to see that “God is Love”. Leonard built his mountain using adobe mixed with straw to hold it all together. After he molded his art, he would coat it with paint, which would keep the wind and rain from eroding it away. The more paint, the thicker the coat, the better and stronger it became. People come from all over with donations of paint. 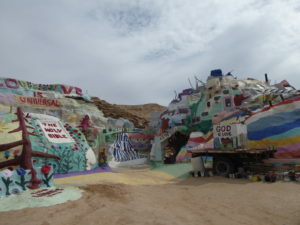 It is estimated that he put well over 100,000 gallons of paint on his mountain. Leonard passed away on February 10, 2014 at the age of 82 and spent the last two years of his life in a nursing home. 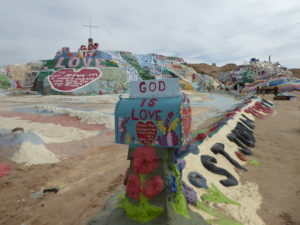 A non-profit group now manages Salvation Mountain and has hired a caretaker to maintain the site to protect the mountain from vandalism and thieves. The caretaker’s campsite is in the background. 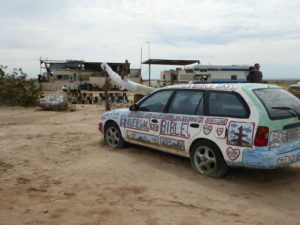 This entry was posted in California and tagged Leonard Knight, Salvation Mountain, Slab City. Bookmark the permalink.